Basement Mold Have You Worried? Call D-Bug! Mold anywhere in your home is a serious issue. It’s not the unsightly, unpleasant look along your walls and floors that’s a problem – mold can cause serious health issues for your family. Black mold is the worst. Black mold, also known as Stachybotrys chartarum, is a danger to your home and to your health. Symptoms can be as mild as a stuffy nose, congestion, and wheezing to skin and eye irritation, shortness of breath, fever, and even fungal infections of the lungs. For children with asthma or the elderly suffering from chronic obstructive pulmonary disease (COPD), the consequences of mold exposure could be severe. Given enough time to grow undetected, mold attacks the wooden structural materials of your home, and can even weaken load bearing walls. At D-Bug Waterproofing, our dedicated mold remediation teams save your home and your family from the dangers of black mold. We’ve been serving the Westmoreland County and Pittsburgh areas for over 79 years! We'll help make your home healthy again. Waterproofing is essential to the health and livability of your home, but why stop there? At D-Bug Waterproofing, our dedicated basement renewal teams not only repair foundations and waterproof basements, they refinish and remodel too. By waterproofing, you’ve already decided to make an investment in the health and welfare of your home. Take the next step – transform your repaired basement into a family room, entertainment room, or even a man cave! You might not expect a waterproofing company to put up walls, install lighting, lay in flooring and carpets, wire electrical and move plumbing, but at D-Bug we do it all, and we do it all very well! Our reputation is based on full service. In fact, many home owners call us back, year after year, for finishing and beautification projects both inside and outside the home. Most often, we are called upon to remodel or finish a basement our teams are waterproofing using French drains, or where we are repairing a foundation. A water-proofed basement is an excellent candidate for refinishing, as you can be certain there will never be a water problem or mold. Your new room is dry and secure. First, a vapor barrier is placed on the foundation wall. Secondly, the walls are studded from floor to ceiling. We also insulate the walls (if the customer specifies). We use mold resistant drywall, spackle and sand, then paint the walls whatever color you desire. We can drywall the ceiling or install a drop ceiling, whatever you prefer. But we don’t start there, at D-Bug we also install flooring, including ceramic tile, carpet, or linoleum. Walk through your basement with us, and we will help you envision the dream space your basement can become! 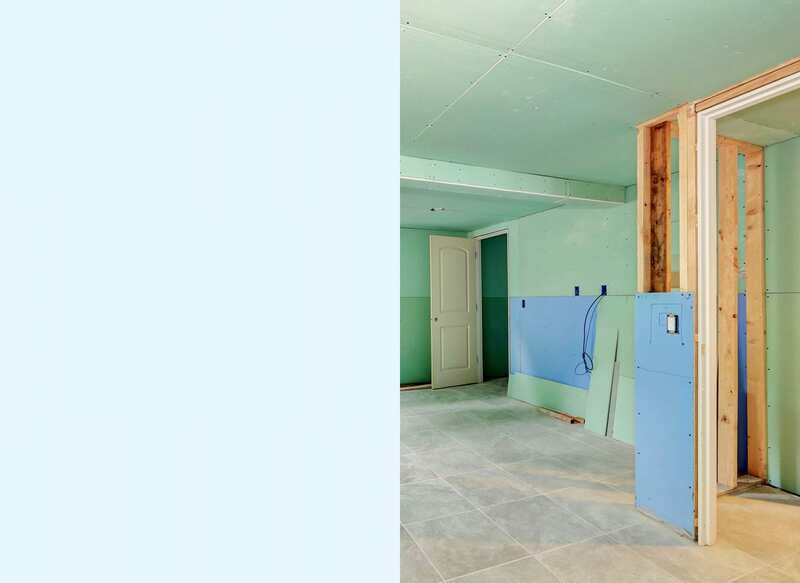 When finishing a basement, it’s the perfect time to add a bathroom. Our experts do all the necessary plumbing, build the walls, and install the fixtures. Located in Greensburg, PA, D-Bug Waterproofing has been serving families across the Pittsburgh region since 1939. We’re family owned and committed to doing our best for our neighbors throughout Western, Pennsylvania. Our comprehensive services can take you from a damaged, leaky cellar to a beautiful basement with one call.